On a sunny winter’s day the playground you need is exactly the opposite to the one you need on a sunny summer’s day. Avoid those shade cloths and find a playground without. If you are around the western suburbs, here’s a great one to head to, especially if you have older children as well as your under fives. PS Don’t forget the bikes and trikies. There are really three play areas in this park. The under fives will first flock to their own space, a good playground especially for bold toddlers and preschoolers. 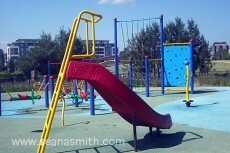 It is colourful and bright and has a slide, climbing wall, roundabout and climbing frames. Close to this is the seriously adventurous adventure playground. Large signs warn that young children need close supervision. The playground has big forts, very long slides, loop-the-loop slides, long tube slides, flying foxes, swaying suspension bridges, tyre walks, Roman rings and a lot more. This is not a playground built for the under fives at all and the ones who dare to try it will need careful attention and help. Nearby is the Road Safety Training Track, a very elaborate bike track. It has a real road layout with roundabouts, road signs, pedestrian crossings, a refugee island and road humps. There are benches around the track. As with the playground, there is no shade so it can get very hot. But shaded picnic tables are provided in the park, plus a rotunda and a large waterfall wall—all appreciated by the kids. Shade: Not nearly enough, not a park for hot days at midday. Mum’s report: We enjoy it almost as much as the kids. It’s hard work for parents though as it really is too old for the under fives, so steer them towards the huge bike track after a while. Map reference: Gregory’s 307 K10, Sydway 272 H2, UBD 210 Q10 See it on Google maps here. Would your kids like to visit? Have you visited already and, if so, what was their favourite part of the playground? We were headed to a birthday party here today and I googled it for directions and stumbled upon your review! It was such a lovely afternoon, I wish I’d read the part about the shade BEFORE we left tho as I didn’t take hats for the girls and it was hot out there. Hello Emma, thank you… yes, the lack of shade is an issue there isn’t it. And it’s that time of year when we need to remember to take hats which I haven’t had to worry about so much over the winter. Need to have my hat bag all sorted and ready to go at all times. Would appreciate photos of the bike track? Yes, I need to get back there, maybe you could search Google images in the meantime? ?